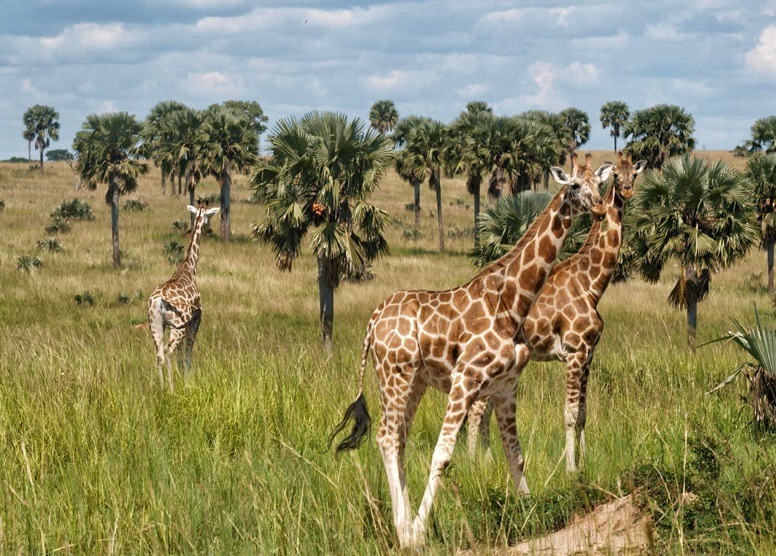 The Rothschild giraffe is one of the famous Uganda safari attractions that thrive in the abundant savannah landscapes of Uganda especially in the protected areas of Kidepo Valley and Murchison Falls National Park. The Rothschild giraffe is a unique feature which was described by the earliest explorers as a cross between the leopard and a camel. Indeed, a giraffe is an awkward looking feature. The giraffe has got a swaying gait that is brought about its movement. The giraffe moves the right legs together and the left legs together as it can be encountered by travelers on safaris in Uganda. The Rothschild Giraffe takes pleasure in enjoying the spiky acacia from which it consumes its leaves using its long neck and the double purple tongue. The Rothschild Giraffes are the tallest land mammals in the world with the newborn giraffe standing at a height of six (6) feet – 2 meters. The neck of these Species always encountered on Uganda safaris and tours have got seven (7) vertebrae which are the same as that of a human being. The beauty of this creature which stands as curious gentle and giant natural feature was a fascinating factor even for the indigenous Africa inhabitants. It inspired their art paintings in various caves around the African continent. However, one can note that the unique characters of the giraffe are at times caused them to be of interest to the hunters. The tails of the Giraffes would be crafted into bracelets, threads for sewing and bead threading not forgetting fly-swatters. The Rothschild Giraffe which can be reached in Uganda is considered endangered Species of Giraffe with below 700 members known to be remaining in the wild. This has given Uganda an advantage prompting various travelers to plan wildlife safaris to Uganda.